For a game that had awesome as one of its defining traits, Konami's Rocket Knight Adventures isn't exactly one of the Genesis' most well-remembered games. Shame. Maybe you'll remember this modern-day successor in its stead. Rocket Knight, a game that serves as more of a spiritual remake than a true sequel to the 1993 original, is at times a side-scrolling platformer, and other times a horizontally-scrolling shooter. At nearly all times, however, it's a hoot. Acid Trip - Rocket Knight looks gorgeous. If you're feeling bogged down in the greys and browns of other titles, Rocket Knight is the perfect antidote, its cheery character models, vibrant backgrounds, memorable bosses and tasteful use of cel-shading leaving us with a game that looks far more polished than a short downloadable title has any right to be. The Right Balance - As a successor to a fairly brutal game from the early '90s—one that retains a vocal supporter base—developers Climax were always going to be up against it balancing the needs of old fans with the accessibility required from a more modern title. They've done a great job. Newcomers can take the game on one level at a time, with generous difficulty settings to match, while veterans can switch to arcade mode—complete with limited continues—and take on a tougher challenge. Low Mileage - I finished Rocket Knight in around two hours. And the second of those was spent on the last few levels. So, yes, it's a very short game, which would otherwise be OK were it not for the fact is costs $15. That's an extreme price point for something so brief, especially when it puts it in the same value-for-money bracket as more meaty titles like Shadow Complex. If you can overlook the high price, and some occasionally twitchy controls in the more confined levels, Rocket Knight is a great way to kill a rainy night in, whether you be a Sparkster fan from way back or simply a newcomer to the series after a taste of how fun a game starring a rat opossum with a jetpack and sword can really be. 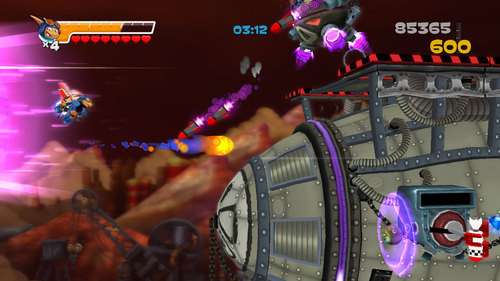 Rocket Knight was developed by Climax and published by Konami for the Xbox 360 (version reviewed), PS3 and PC. Released on May 12. A copy of the game was given to us by the publisher for reviewing purposes. Played game to completion on normal difficulty mode. Confused by our reviews? Read our review FAQ. Konami's Rocket Knight reboot will be released on May 12 for the Xbox 360 and PC via Steam. On May 18, it will launch for the PlayStation 3. The title will cost $14.99 on the PC & PS3 and 1200 MS Points on the Xbox 360. Through its Facebook fan page (via Joystiq), Konami has announced the US release dates for the impending downloadable sequel to its classic game Rocket Knight. The Xbox Live Arcade and PC versions will be available on May 12 with the PlayStation Network version following on May 18, in accordance with earlier reports that the game would be released in May. Long-forgotten rocket-powered armored opossum Sparkster will be blasting back onto the scene in May, publisher Konami has announced with a new trailer and screenshots. The revival--developed by Climax and coming to PC, PlayStation 3 and Xbox 360 as a digital download--postulates that our titular Rocket Knight simply hasn't had any adventures in the fifteen or so years since his last game.